In “Prospect”, necessity is the mother of invention. Like the early Star Wars movies, it exists in a universe that feels cobbled together out of pieces in bad repair, or at least the part of the galaxy we get to see feels that way. We’re introduced to a pair of space freelancers, the kind that they made a lot of CD-ROM games about in the late 90s, that are about to embark on a dangerous mission (is there any other kind?) to harvest gems on a poisonous forest planet. It’s also a space western, not the first of its kind, but a pretty decent example of one. “Prospect”, of course, winks at the notion of prospectors, gold rushes, banditos, and other Western tropes. It features the death of a father on a strange frontier, and a cadre of desperate men and women trying to make it rich and get the hell out. But it’s also, and I say this thankfully, low budget. It’s one of those movies that turns its constraints into boons. 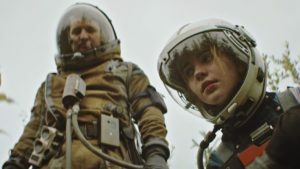 Without the obscene mega-budgets of most blockbusters, “Prospect” has to work a little harder to craft striking science fiction visuals. Some concessions are made. The forest planet, though alien enough, does resemble the Pacific Northwest, or maybe even northern California, and the space guns, though zappy enough, do look just a little bit chintzy. But then there’s a terrifically odd scene, one of the best in the movie, in which one of the freelancers is opening up a strange sac he pulls out of the forest floor, and undergoes a complicated procedure to extract the biological gem inside. It’s an oddly mesmerizing sequence, and one that something with a budget in the two or three hundred million dollar range may not have the time to develop, especially when there are so many gigantic explosions to do instead. Best part is, it’s got actual characterization, setups and resolution (if you perform the gem extraction wrong, it triggers an explosion – might that be useful later? ), and other trappings of actual storytelling. Remember storytelling? 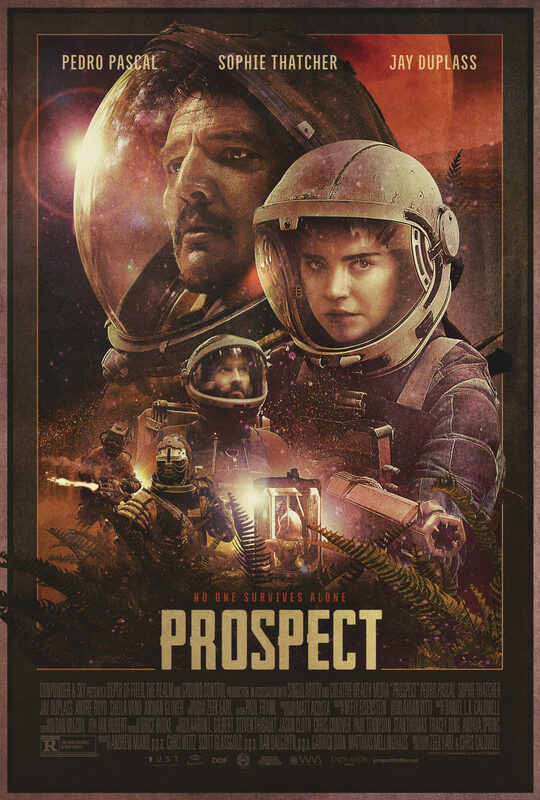 Fans of sci-fi movies, especially plucky little ones that make the best of what they’ve got, should be delighted by “Prospect”. Watch it, and dread the day its writer-directors, Zeek Earl and Chris Caldwell, are snapped up by the studios and lashed to some awful superhero dreck and told to conform.